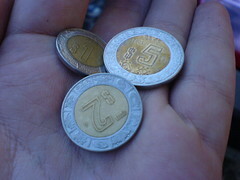 Pocketmint is documenting a month of personal finance in Mexico. For the backstory, see this post. At home in Seattle, I almost never use cash. I carry five to ten dollars around in my wallet ‘just in case’ … and it’s the same five or ten dollars for months at a time. Our last ATM withdrawal was in 2010, for the special circumstance of buying a used car. Before that, 2007. In person, I pay either by credit card or debit card. Twelve debit card purchases a month gets us a great interest rate on our checking account (which doubles as our emergency savings); we use the credit card at Costco and to get cash back on gas and restaurants. In Mexico – at least outside of major gringo tourist areas – it’s the exact opposite. Credit cards are nearly useless, and debit cards are only good at ATMs. In Mexico, cash is not just king, it’s pretty much the only game in town. 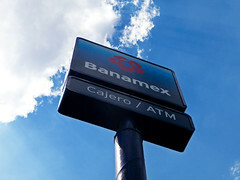 The consensus among expats in Mexico is that the best exchange rate can be had by getting pesos via ATM using your U.S. debit card, so that’s what we’ve done. Turns out the airport ATM wasn’t so great, but the one local ATM we’ve tried here in Ajijic had a much better exchange rate and a smaller fee. Once you have the cash there’s the matter of carrying it around. Even at home I don’t bother with a purse, so most of my clothes are well-supplied with pockets. But my stateside habit of carrying a wallet in my back pocket is ill-advised here, where pickpocketing is more common; instead I simply put loose pesos in my front pockets. Waving a lot of cash around also seemed unwise, so I developed a system where I put larger denominations (500, 200, 100 peso bills and 10 peso coins) in my left pocket and smaller denominations (50 and 20 peso bills and all other coins) in my right pocket. That way I can pay for, say, a 15 peso pineapple without flashing several hundred. At home, using debit and credit cards almost exclusively means that all of our purchases are picked up automatically by Mint, where two or three times a week I log in and assign each one to a budget category. Only once in a blue moon do I have to enter a cash transaction, and then there’s always a good chance that it will be missed – either Jak fails to mention it, or I forget to record it. Here in Mexico, it’s all cash all the time, which means a whole new tracking system. Most of our purchases are one- or two-item transactions with individual vendors where there is no receipt – much like going to a farmer’s market. But I came prepared: the former wallet back pocket is now home to a little notebook in which I write all sorts of things, including sometimes a record of checked prices or what I’ve spent. Ironically, the fact that everything is cash means nothing gets forgotten, as it immediately became clear that I need to do an accounting at the end of each day. I started a simple spreadsheet where I record our cash withdrawals and subtract each day’s expenditures. Then I count our cash pesos and check the total against the spreadsheet. Then, in order to keep using our budget categories in Mint and square everything with our dollar-denominated bank accounts, I have to sit with a calculator and convert each peso purchase to dollars at the exchange rate of our most recent ATM withdrawal. Because there are so many individual purchases, that’s a lot of line items to manually enter. For the first couple of days this seemed like a great deal of trouble, but within just a week it’s become a quick little routine. Of course, I can enjoy spreadsheets and data and making the numbers come out right; Jak, on the other hand, was so annoyed the first day when I made him account for every peso that he simply turned over all the money to me. I am now the sole Keeper of Cash, unless he’s going out by himself. I think if we lived here permanently I would start to compile, say, all the individual grocery purchases from one day’s street market into a single entry: Chapala tianguis, 131 pesos. But right now I am gathering detailed price data, so I want to record that 4 bananas (at 8 pesos per kilo) cost 5.5 pesos and a kilo of dried black beans was 19.5, instead of lumping them together. The running tally of cash has one other benefit: it keeps me from misplacing money, which is apparently a significant problem otherwise. If my daily count comes up short, I know I’m missing something somewhere, and go hunting for it. 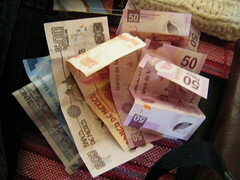 So far I’ve found coins stuck inside a folding map, and a crumpled $100 peso note in a shorts pocket in the laundry. So with a little practice the prospect of change, in either sense of the word, has become less daunting. On to the next challenge! Fascinating. I love your dual pocket solution. As I like to say: pockets are power. I realize that since you are on a research mission the importance of logging all the purchases is of the utmost importance, but this underlines to me one of the reasons I like to use cash on a daily basis. I also find that with cash, I make a stronger connection to price, and am more aware of my spending practices. And, having been burned in the past, I place a value on not feeding the credit card and banking industry. Using credit/debit cards places a financial burden on the (often small) businesses we choose to spend our money with. Everyone likes cash, and I prefer to be that kind of customer. One question about food budgeting in Mexico: how much price variation do you think is seasonal? The answer to price variation will likely not become completely clear until we’ve been there during a couple of different seasons. Our current plan is to go back sometime late in 2013, and I’ll compare base prices then. For the month we were there, produce prices were extremely steady, with one exception: avocados. Sometime in the second week we were there — right about the time you wrote this question, in fact — there was a clear shortage of avocados, and the price per kilo shot up by about 50% over the previous week. I feared at first that we were seeing the end of ‘avocado season’, which baffled me, since the Internets tell me that avocados (like most fruits) are a year-round crop in Mexico. Then in the third week, the supply rebounded partway and the price dropped again, settling perhaps 15% over the original baseline, where it remained until we left. So maybe it was a temporary supply fluctuation? Regarding your cash strategy: the budget system we implemented last year, although not reliant upon cash, still allows for spending equity and the kind of intra-spousal gifts and treats that you mention. I talked about that discovery in this post. However, after a full month wrangling the pesos, it’s clear to me that the microtracking is long-term unsustainable, and that we will have to switch to a sort of category ‘envelope system’ in the future, something much closer to the cash system you describe. I’m working on a follow-up post about that. I also admire your ethics around credit & debit cards. I don’t think a completely plastic-free existence is ideal for us here and now, but I will certainly make an effort to move to cash whenever I’m patronizing small businesses. The inconvenience of remembering an occasional cash purchase seems trivial after the logistical complications of tracking expenses over the last month! Hi there to every one, it’s genuinely a fastidious for me to pay a visit this webb page, it includes useful Information. Remittances help drive Mexico’s economy, from paying for new home construction to schools, especially in low-income areas.